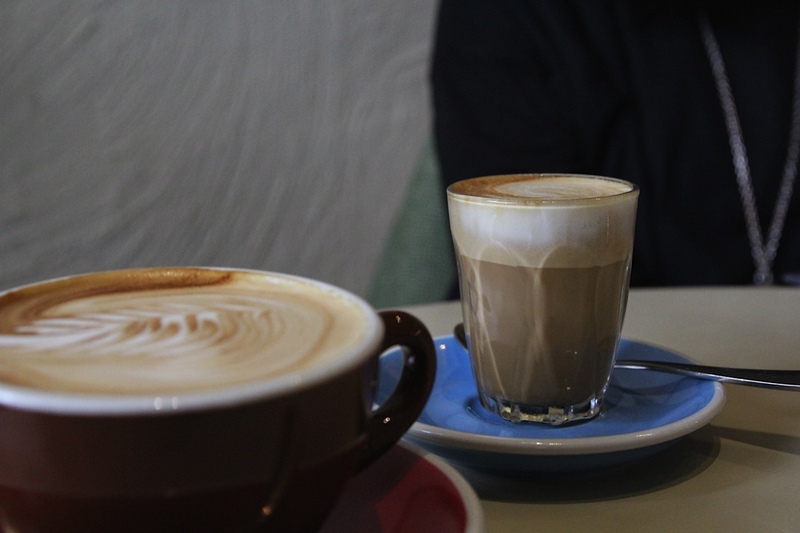 Nestled down the residential end of Bay Street, Brighton is a locals kind of a cafe. 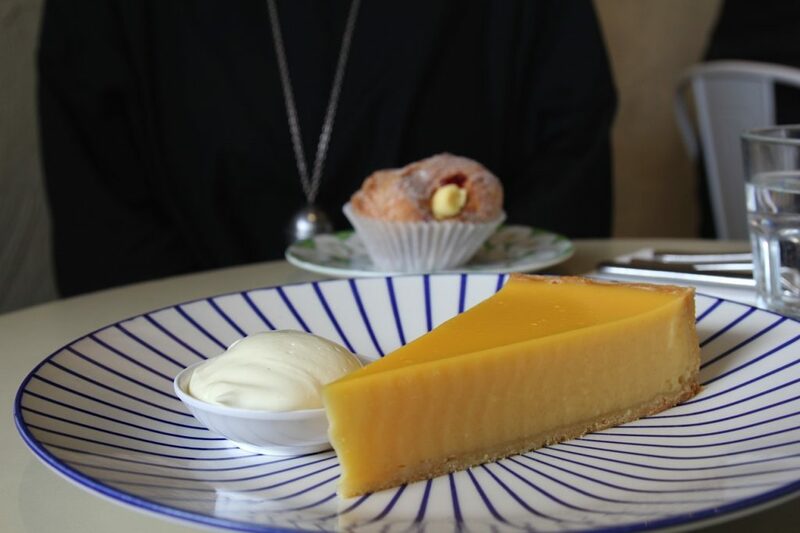 It offers breakfast staples including the likes of corn fritters and eggs benedict, take-home meals, sausage rolls and pies for the eat and run diner and a selection of house-made sweets which will have you salivating including an incredible lemon tart (more on this later). It’s not trying to win the title of Melbourne’s coolest cafe nor is it one for the hipsters. But if it’s honest, ‘takes you back’ kind of food you’re after then Bossy Boots Cafe and Food Store will tick all the boxes. We visit on a Sunday and find the cheerfully bright space filled with families and couples settling down to their Sunday brunch. We order coffees (Supreme beans) and spend an inordinate amount of time in front of the cabinet- there are baguettes, cheesy squares of lasagne, vegetable pasties, pies, cruffins, flourless orange cakes, add to this the breakfast menu and it’s impossible to make a choice. 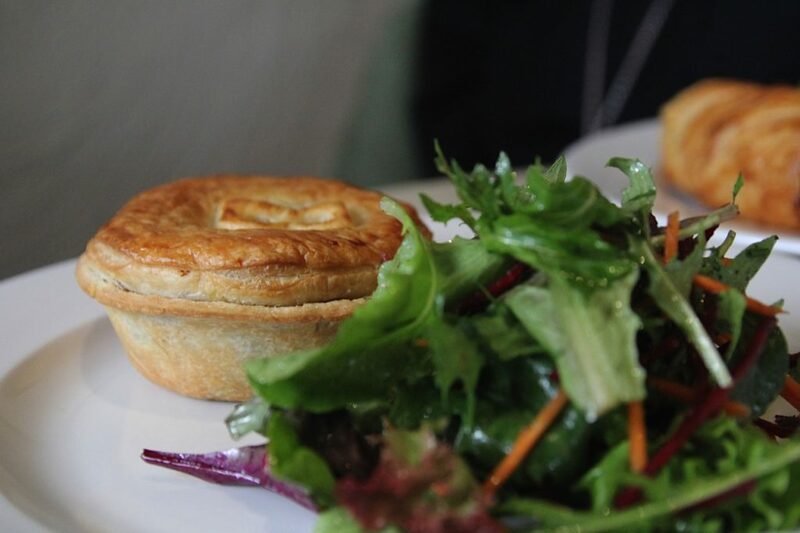 We decide there isn’t any point in resisting our strong urge to order a sausage roll and a pie (beef and gravy, chicken and vegetable and braised lamb shank available on our visit), both come with salad and relish which is made in house. 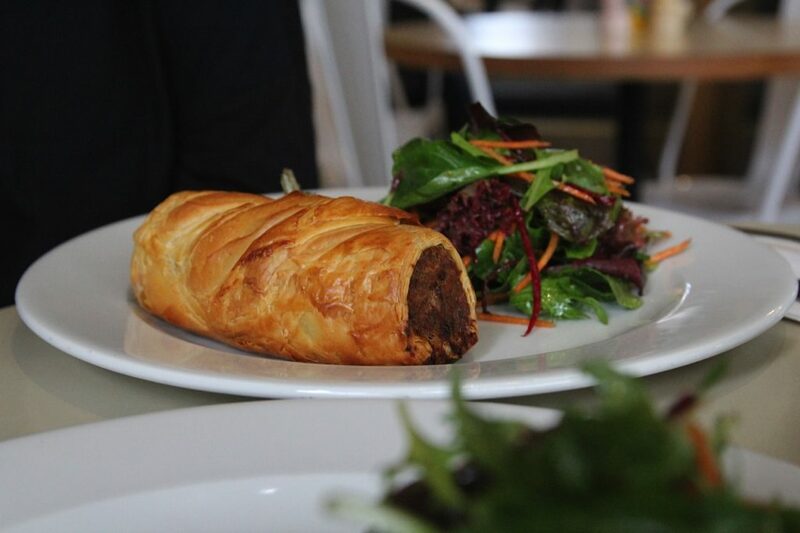 You won’t go hungry with Bossy Boots’ sausage roll, it’s pretty hefty. The dense sausage filling is packed with flavour and wrapped in light filo pastry which works well against the richness of the meat. 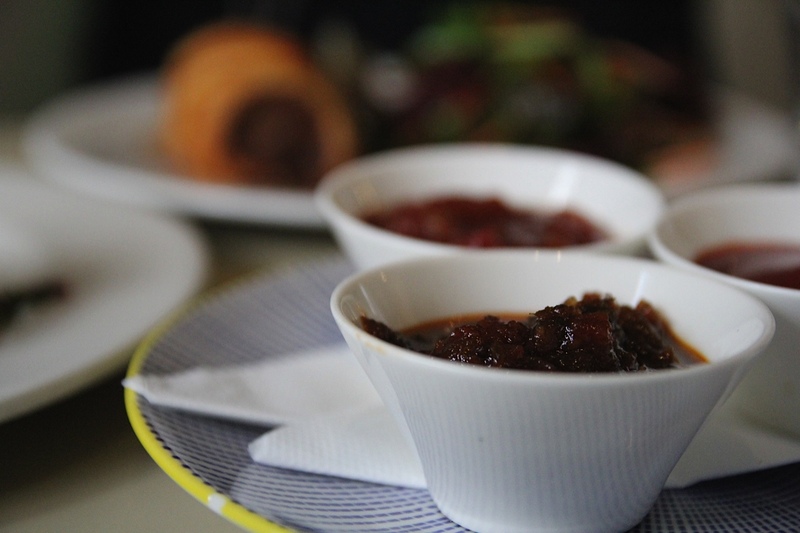 We smear tangy tomato relish over each enjoyable bite. It’s the epitome of a good, old fashioned sausage roll. 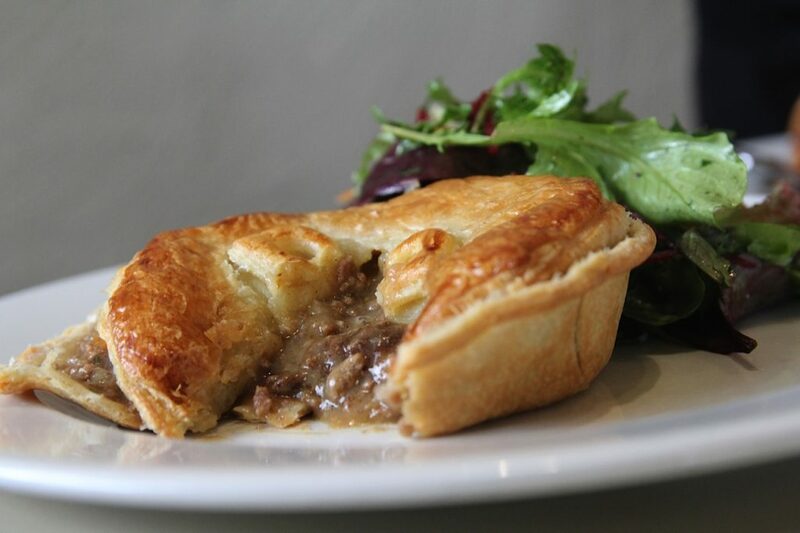 The beef and gravy pie is made up of light but decadent pastry- you can taste the butter in each mouthful. The filling of minced beef and gravy filling is tasty but it could be richer and have more depth of flavour in our opinion. We can’t resist the sweets- whether you’re a chocoholic, one for the citrus or a traditionalist (butterfly cakes anyone!) there’s something for you. We opt for a cruffin and a slice of baked lemon tart- it’s turning out to be a pretty good Sunday morning! 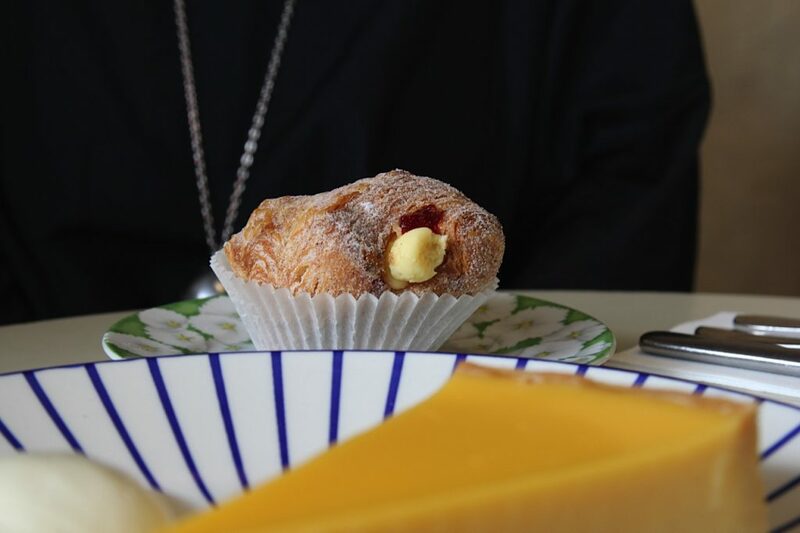 The cruffin, a croissant and muffin cross is injected with vanilla custard and raspberry jam- you know the kind you find blobbed on cream doughnuts? Again, the pastry is stunning- flaky and light. The thick custard and sweet raspberry jam go hand in hand and make it a dessert well worth eating. Bossy Boots sell out of these regularly and we can see why. But it’s the lemon tart that completely wins us over. We’d travel for this tart. It’s wobbly, silky and the citrus tang to sweet ratio is spot on. The pastry is thin and showcases the star of the show, the filling, to perfection. The accompanying cream is redundant, the tart simply doesn’t need it. It is incredible. If you’re eating at Bossy Boots, do not leave without sampling it, take a piece home if you must, buy the whole tart in fact, that way there’ll be less fighting between you. Bossy Boots delivers on its promise of honest food, the staff are friendly and attentive and whilst the prices are at the higher end of the spectrum (we’d get the sausage roll to go) you know you’re paying for quality ingredients and food made with care. 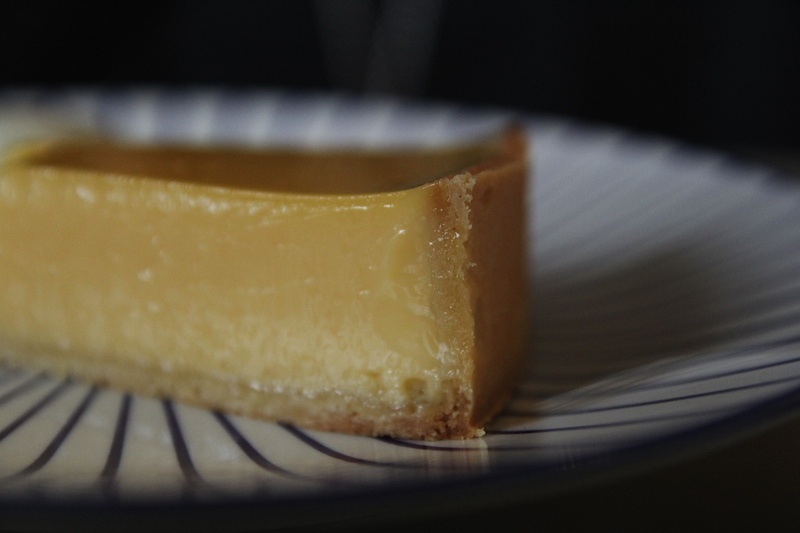 And that lemon tart. Drool.